Baking, Baking… I am really amazed by people who can bake, i used to watch my aunt bake a lot of goodies every weekend when i was a kid, she definitely loves to stack up on food in her fridge. But i find baking very tiring and messy, so i made a vow that i wouldn’t really try. So after having kids i broke the vow, okay maybe i can do the simplest one for my kids like brownies and muffins, and so i did and found it very flattering to find out my kids liked it. Hubby started to buy me baking books. When i was pregnant with my fourth child, i decided to try one from the book and my cake turned out hard as a rock and i got frustrated, my second take was a doughnut that my colleague from work used to bring all the time. It was tasty ! i got inspired to try once more and out of impatience, i just left the kitchen without finishing what i started, hubby has to clean up the flour and all. Last few weeks i remembered the uninspiring memory of my doughnut trial, i gave it a go again and very hopeful with fingers crossed, that it would turn out well. and if it did then i believe i’m into a new endeavor of my life…. Baking! 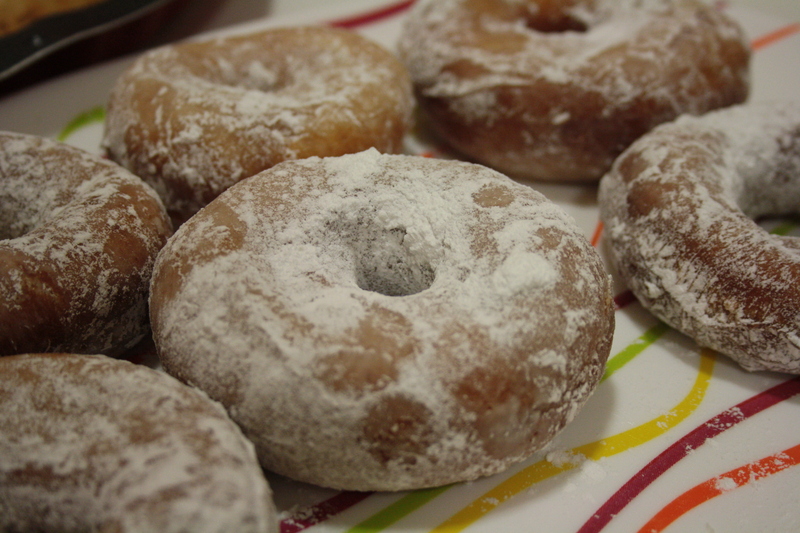 So, now it’s 2012 and after the failed trial last 2005, here are the photos of the night the doughnut was born in my kitchen. after an hour waiting for it to rise…i’m excited! Put butter in the milk and heat in the microwave til the butter is melted but not boiling.in case the butter is not fully melted, just stir through. add the beaten egg then add the flour a cup at a time. you may use a stand mixer ( but in my case just a wooden ladle) til all the flour is incorporated. dip in a hot oil , flip on the other side when its golden brown and it’s ready. I do not have a doughnut cutter so i improvised using my condiment bowl and a medicine cup to punch the holes. I really do not like splattering flour so i always use aluminum foil while kneading for easy clean up. now, the real deal , let’s see what will happen. *combine the ingredients adding milk or water a spoon at a time. the consistency should be thin. 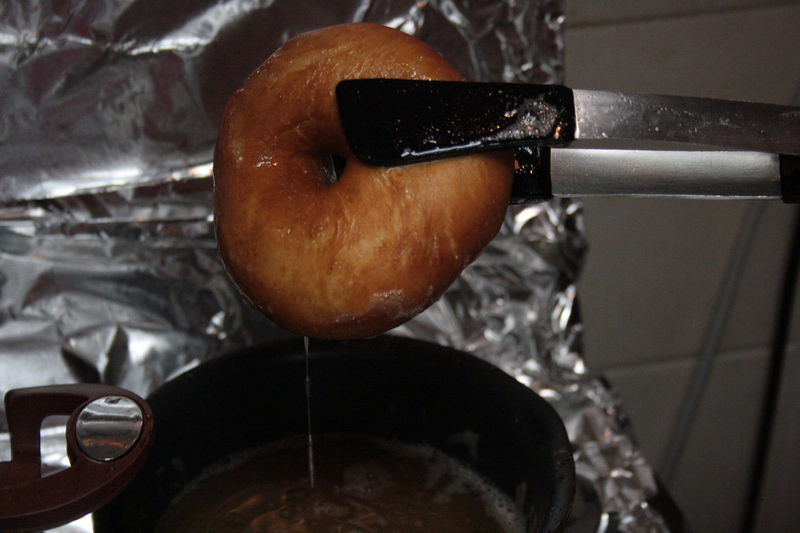 dip the doughnut. *mix the ingredients adding water by tbsp at a time til you get a very thick but spreadable consistency. You may add a food color that you like. for choco frosting add melted chocolate in the the icing sugar before adding water. After a long years of waiting, i made it successfully, i’m on my way into baking again.. baking is a test of patience, and i have learned that very well. Next postSummer is not only for people. Trèsors De Luxe – Thank you. I also found out that this dough can be used in varieties of breads you wanted to make.